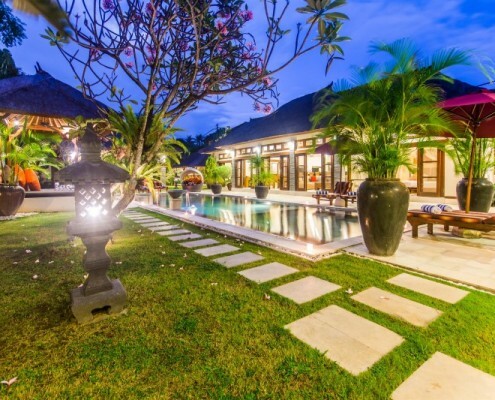 Whether you’re enjoying a much needed getaway with extended family and friends, or looking for a great pad to share when attending a Bali wedding, the variety of 5 bedroom villas in Seminyak all with private pools and beautiful lush tropical gardens, available from Villa Bugis are sure to meet your holiday needs. Seminyak is one of Bali’s most revered and sought-after beach resort strips for holidaymakers the world over. Located away from the flashing lights of Kuta, while boasting the hottest restaurants and bars, shopping boutiques and spa facilities that all Balinese vacationers dream of, whatever kind of holiday it is that you’re seeking, Seminyak is exactly where you want to be. After all, what could be better than finishing your day watching the sun sink into the Indian Ocean over Seminyak Beach – cocktail in hand, of course? These properties offer an affordable accommodation option for a large group, without compromising on amenities or quality. Our range of 5 bedroom villas can’t be beaten for location, with the beach and the shops just a 10-15 minute walk way. The 25 minute drive from Denpasar International Airport will fly by in no time, thanks to our complimentary airport transfers for all guests. With all of the standard features and inclusions you’ve come to expect in Balinese villas – free Wi-Fi, free breakfast daily and air-conditioning, your very own private pool, just to name a few – staying in a Villa Bugis villa is sure to make your holiday a memorable one.